Seventy years and billions of words after the defeat of Nazi Germany, that is the uncomfortable, rarely voiced question that dogs any new novel about that era. Is the unique evil of the Holocaust sufficient justification for continuing to churn out books about it? When the writing, plot, characters or theme are sufficiently compelling, the question can be ignored by saying: This isn’t just another World War II novel—this is a good novel in itself. 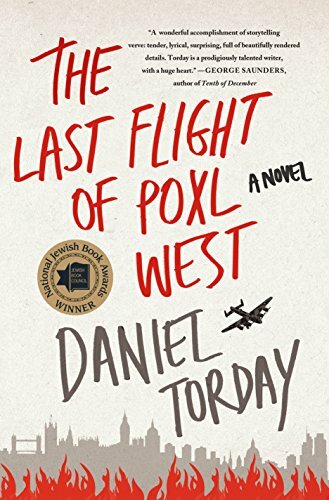 The Last Flight of Poxl West is daringly different enough from the canon of Holocaust-themed novels to safely escape the question. Indeed, it offers an ironic challenge to the whole concept of Holocaust fiction. However, it is marred by a narrative style that too often slips out of its appropriately fussy voice, into heavy-handed clichés and preachiness. Adding a layer of creative complexity, Poxl’s “memoir” is enveloped within a second memoir, the worshipful recollections of a Boston teenager named Eli Goldstein, who is the grandson of a longtime teaching colleague of Poxl’s. Eli avidly reads and re-reads Poxl’s memoir. He writes a history paper on it; he researches the war obsessively. Yet he can’t help resenting that his “Uncle Poxl” never sends the autographed copy that he’d promised. Gradually, other doubts creep into the book. The great war hero, for instance, flew only five missions. “I saw my mother next. For a while, The Last Flight of Poxl West seems to cast doubt on the conventional image of World War Two by focusing on Poxl’s qualms about the German civilians who were killed and grotesquely injured by his bombing sorties. Then the novel seems to say that his yearning for his lost love is more important than either his wartime heroics or his guilt. Finally, in yet one more twist on the Holocaust, the novel undermines Poxl’s unique, heroic memories altogether. But the reason we keep publishing and reading Holocaust novels is precisely because we must remember.